I've modeled a robot in Blender 2.6. It's a mech-like biped or if you prefer, it kindda looks like a chicken. Since it's symmetrical on the XZ plane, I've decided to mirror some of its parts instead of re-modeling them. Problem is, those mirrored meshes look fine in Blender (faces all show up properly and light falls on them as it should) but in Unity faces and lighting on those very same mirrored meshes is wrong. What also stumps me is the fact that even if I flip normals in Blender, I still get bad results in Unity for those meshes (though now I get different bad results than before). Now, the selected cog-wheel-like piece is the mirrored mesh obtained from mirroring the other cog-wheel on the other (far) side of the robot torso. The back-face culling is turned of here, so it's actually showing the faces as dictated by their normals. As you can see it looks ok, faces are orientated correctly and light falls on it ok (as it does on the original cog-wheel from which it was mirrored). It looks like the normals are in the wrong direction. This is already very strange, because, while in Blender, the original cog-wheel and its mirrored counter part both had normals facing one way, when importing this in Unity, the original cog-wheel still looks ok (like in Blender) but the mirrored one now has normals inverted. 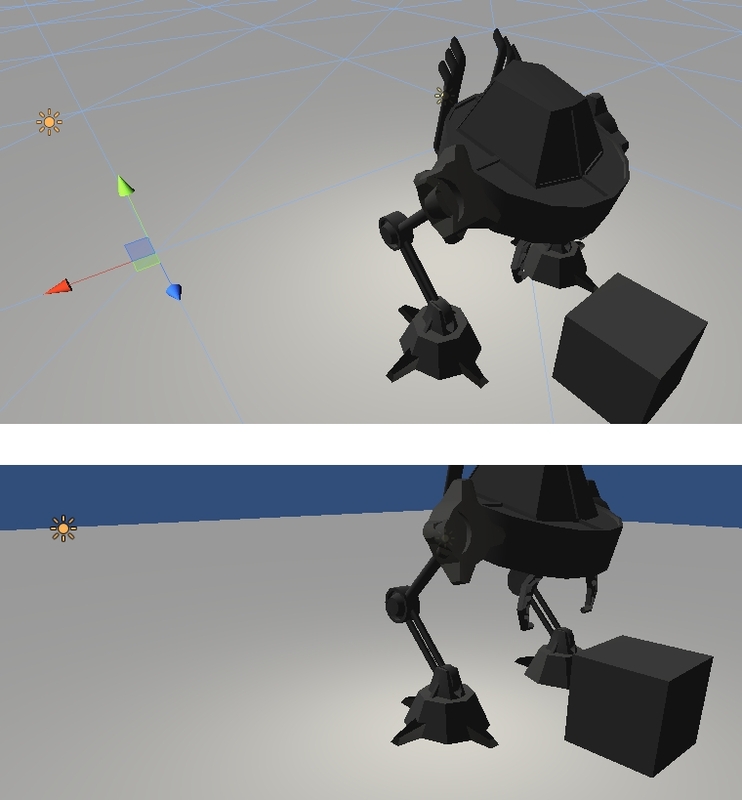 Now in Unity, even though the light comes from the back of the robot, the cog-wheel in question acts as if light was coming from some-where else, its faces which should be in shadow are lit up, and those that should be lit up are dark. in Unity I've tried playing around with the prefab import settings like "normals: import/calculate", "tangents: import/calculate"
So, my question is: is there a way to actually mirror a mesh in Blender and then have it imported in Unity so that it displays properly (as it does in Blender)? If yes, how? Thank you, and please excuse the TL;DR style. OK, I've solved it. Apparently it's normal than Blender does this when you mirror an object. The thing to do, in Blender, before exporting, is to select the object in question, hit CTRL-A, and from the menu that shows up, select (Apply) "scale". 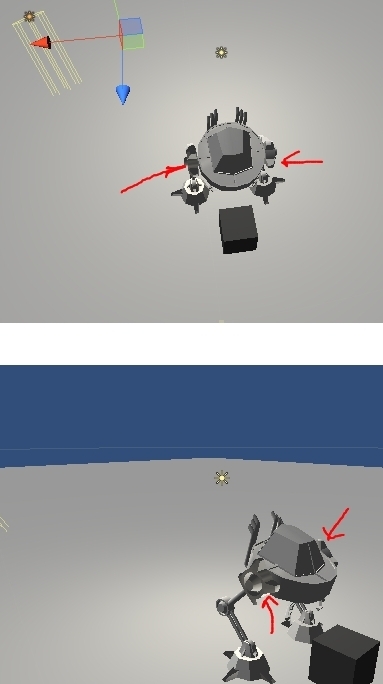 To my shame, I do admit that I've now noticed that for objects such as my screwy cog, Blender would issue a warning along the lines of "something's bad with this objects transforms, apply scale to fix" when exporting, but that really didn't explain what was happening (plus, it issued this messages for other objects, which were fine when imported in Unity). The above answer does indeed solve the problem, but I've also found that unless I recalculate the normals after applying Scale, the problem still occurs. So - Mirror object, Apply Scale, Recalculate Normals - Hey Presto! Not the answer you're looking for? Browse other questions tagged unity blender normals or ask your own question. How can I fix the face/normal direction of my 3d mesh in blender/UE4?